The Quantum Semiconductor Systems group studies the behavior of electrons confined in reduced dimensional systems subject to strong mutual interactions. 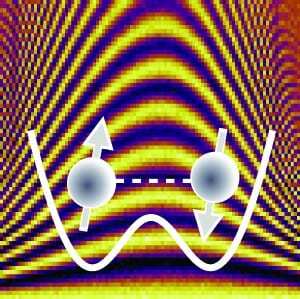 Researchers in the Quantum Semiconductor Systems group use a variety of techniques including semiconductor growth by molecular beam epitaxy (MBE), nanofabrication and low-temperature transport to explore this exciting field. MBE is a process to fabricate crystalline semiconductor heterostructures for the study of novel physical properties and solid-state device technology. In an MBE system we can grow heterostructures of dissimilar materials with atomic monolayer resolution. 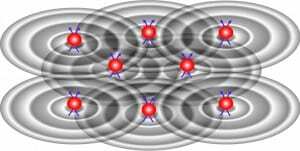 This allows us to explore the properties of strongly interacting electrons in two dimensions. 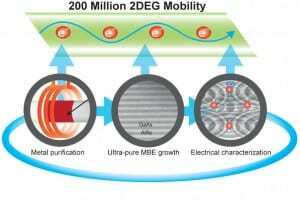 We also exploit the nanofabrication facilities at the Birck Nanotechnology Center to further confine electrons in 1D (quantum wires) and 0D (quantum dots) structures. While these reduced dimensional systems exhibit many emergent phenomena due to collective behavior, they also hold promise as platforms for quantum computing. 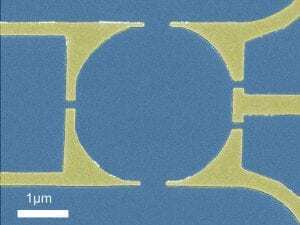 The Quantum Semiconductor Systems group uses electrical transport experiments at temperatures down to T=10mK and magnetic fields up to 15Tesla to interrogate the samples we create. 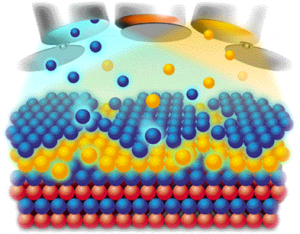 We also use MBE to pursue novel light-emitting sources in the Al(In)GaN heterostructure system. You will find brief descriptions of our ongoing projects below. Hybrid semiconductor (left system)-superconductor (right system) double chamber deposition system in Station Q Purdue.